Welcome to a new monthly column on the Pronto blog. Pronto’s Treasurer and Events Coordinator David Rondinelli writes Pronto Presents, a series of interviews with people who work within Pronto or the comics industry in general. Our first interview, naturally, is with Pronto Comics Editor in Chief, Dominic Sparano. In the world of comics, most consumers scour the shelves to see their favorite characters take on larger-than-life conflicts. With an engrossing story and dazzling art, many might ponder exactly how it all comes together. It may take the leadership of a superhero to see the world to safety, but who are the leaders that guide the lives of these characters? The answer is the mild-mannered everyman. 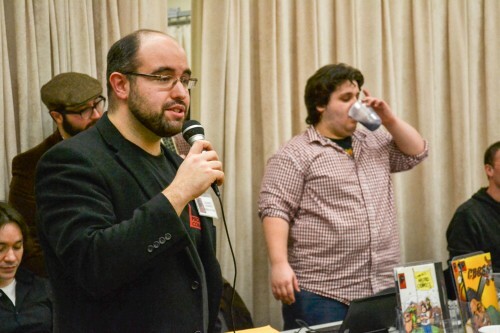 Dominic Sparano, 30, is editor-in-chief of Pronto Comics and one of those men. A native of Huntington, Long Island, New York, Sparano received a master’s degree in art from Adelphi University. As an accomplished sculptor, inker, and illustrator, he has made several careers out of his hobbies. Light on his feet, he is also a ballroom dance instructor with a flair for cooking, writing, and travel. In this debut series, new to the Pronto Comics blog, Sparano opens up about what it takes to make a vision a reality. Pronto Presents: You are currently the Editor-in-Chief of Pronto Comics. Many know how Pronto Comics got started, but tell us your personal story of how you got into the group and how you eventually became the leader. Dominic Sparano: I met Achilles Yeldel at Buddy Scalera’s Creator Connections at the 2009 NYCC. I made sure to keep in touch, because at the time I was trying to build an inking portfolio. About 3 months later Achilles got in touch with a project that he put together. [It was] a group of people he called “the breaking-in network.” The project became Pronto Comics’ first book, For a Price. 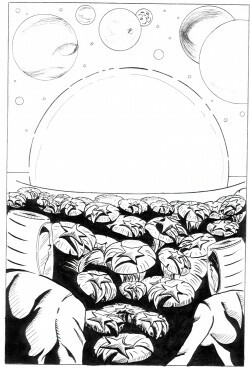 I inked two stories in the book, which was a very enjoyable experience. Pronto decided to keep going and make another anthology called Kicked, in which I also inked two stories. 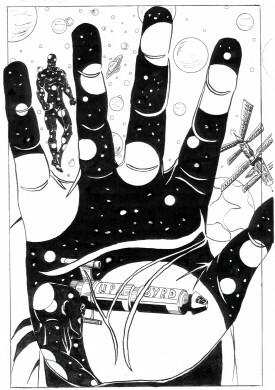 During that time, I would come to meetings when I could and accepted a couple of other inking projects when possible. As the group expanded, leadership needed to be formalized. Achilles proposed a board of directors. The discussion of who should be Chairman came up and he eventually suggested it should be me. That position became the editor-in-chief position I have now. PP: How do you feel your leadership has shaped Pronto? DS: My vision for Pronto Comics was and still is for it to be a viable company that specializes in finding and fostering new talent. With this vision comes the necessity for organization and structure. I like to think that as I continue to improve as the editor-in-chief, so does Pronto Comics as a publishing company. We are constantly looking for ways to make Pronto Comics the best it can be and to put out the best comics we can. PP: You have held different titles with Pronto. What are some of the other things you have done in the group? 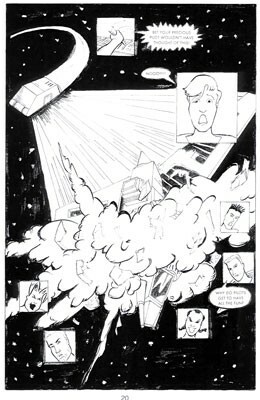 DS: At first I was an inker, inking several stories in some of Pronto’s first anthologies. Later I wanted to edit an anthology myself, which is perhaps the best on-the-job training one could ask for. I was also the first to put together Pronto Comics’ expanding online infrastructure: the Facebook page, blog, YouTube channel, and so forth. Others have since added to it. PP: Take us through the daily process of what it is like being an editor-in-chief. What are some of the specific duties it entails? DS: It always begins with checking my email. Being the editor-in-chief is primarily about communication and responding to people. I will get emails about books, submissions, and other Pronto Comics business. Often there will be files in my Dropbox account that needs to be reviewed or comic book pages that need to be prepared for print or to be released as an online preview on our site. The other aspect is planning. Planning what books will be ready for what event, what events are good for Pronto to be a part of, or what events we have coming up like Phrases to Pages 3. In addition, there is just the planning on where to take to the company to further it. Finally, there is the implementation of the plans. That often entails posting on social media, emailing, texting, or updating the website. I spend a lot of time looking at a screen. PP: Of all the Pronto projects that you have been a part of, what have been some of the highlights? Some of the challenges? DS: The highlights are easily putting together Phrases to Pages. It was one of the first things that made me feel that Pronto Comics is really stepping into its own. The other joy of that was that it was a complete team effort on the part of the Pronto board. I was and still am proud of all the work that each of the members have done. Other highlights have been the conventions we’ve been a part of, and how well the team has adapted to self-promoting and selling their books and Pronto Comics as a brand. I love telling people who we are and hearing back from them, “Oh I’ve heard of you guys.” It tells me that the people I work with are the hardest working people in comics and I am proud of all of them. The most personal highlight was running into C.B. 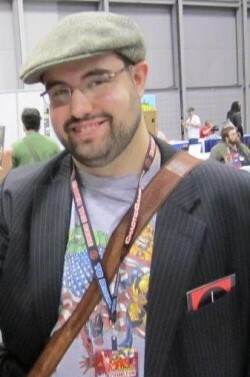 Cebulski at the 2012 NYCC and him recognizing me from Twitter. That was cool. In terms of challenges, the biggest challenge was getting the members to think of Pronto Comics as a company and not a club. This meant that the funds we raise always must be invested and used to advance the company wisely. In the past, we didn’t always do that, but I see that as the learning curve. You’ve got to make mistakes: the key is to not make the same mistake repeatedly. PP: What is it about the comic book medium that appeals to you? DS: I love story. I love the combination of words and pictures and the creation of them. I see it as modern folklore and as a high art. I want it to be the best it can be. PP: What is on your comic book reading list right now? DS: I’ve been catching up with a lot of trades lately. The Walking Dead, Chew, The Lunas Bros., The Sword, Luther Strange, Morning Glories, a lot of independents. Though, I love superheroes too. DS: Spider-Man. Cause he is the every man. After him comes Batman and Wolverine. Two storylines that I remember reading as a kid were the Clone Saga and Death of Superman. PP: You have artistic ventures that stretch across the board. What are some of the other creative things that you do? DS: I am a potter and sculptor. I work in several college and private studios. Currently I am contributing to an Empty Bowl charity event called “Why Hunger,” which is run by Harry Chapin’s brother. Also, I am an illustrator, though that career has been a little on hold since focusing on Pronto Comics, but lately I have been focusing on making small digital illustrations and photo manipulations. I hope to start creating more of my own work this summer. PP: Who are some of the artists that most influence your own art? DS: In terms of pottery and sculpture, I like Henry Moore, David Smith, and Paul Soldner to name a few. When it comes to illustrators, Frank Frazetta, Thomas Nast, Julie Bell, and Boris Valejo are favorites. In general, I love Renaissance art, Art Nouveau, and ’50’s–’60’s modern art. PP: As a dance instructor, which dances do you enjoy teaching the most? DS: Primarily I love Latin and rhythm. My favorite and specialty is Argentine tango because of its creative and improvisational nature. Unlike other dances, there are guidelines but little to no rules. After that, I love salsa, cha-cha, and swing. PP: After four years, what are some of the new things on the horizon at Pronto Comics? In addition, what are some of your upcoming projects? DS: In terms of new things at Pronto Comics, we have some new events planned within the next year. We have many new books in the works that will be coming out in the coming months. We’re going to be attending new conventions that we’ve never done before in the NYC/Long Island area. We’re expanding our blog as well, to bring in new articles and columns. You can also look forward another Phrases to Pages on July 27th and more signings in the future. We plan on having a constant presence at a new comic book store in The Village called Carmine Street Comics. Many of our artists will be sketching there. My upcoming projects will be the building of my own brand of art titled Sparano Arts. You can check that out on Facebook and Twitter. I’ll be applying for shows and putting my work in stores this summer…I hope. Pronto Comics is always first on my mind. 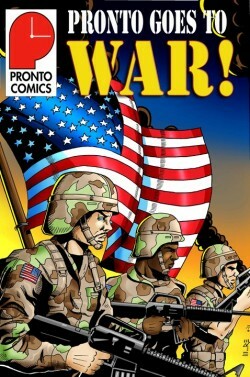 Be sure to visit Pronto’s website, www.prontocomics.com, for details about all our upcoming projects.